Perhaps the oddest result of the entire election was UKIP’s four million votes allowing them to hold on to only one seat. More voted for UKIP than the SNP. Hyped up by numerous media outlets for several years it would have been surprising that they didn’t receive a large vote, but the UK’s electoral system made them its severest losers. They now call for electoral reform. This is ironic in a party that seeks to remove all external impediments from the European Union to create an unfettered Westminster. Labour’s election campaign was not the disaster of 1983 that set the then new leader Neil Kinnock on his drive to “modernise” the Party. That was a civil war with a strong group on the left with a different set of policies that were never supported by the Westminster elite. But it does resemble 1992 when many felt that the fatigue with the Thatcher years and the blandness of John Major might open up a chance of victory for a seemingly triumphant Neil Kinnock. Despite some appalling mistakes such the Edstone it was a competently fought campaign but entirely lacking in any vision. No attempt to challenge the Tories’ economic narrative has ever been made. Instead by skulking away from direct engagements this made them look guilty as charged. And as for that letter…. On the day before polling day, the Daily Record, the main Scottish popular daily, called on England’s voters to vote Labour – surprising because it is not extensively distributed there. It reflected a fear of the result if Scotland voted for either Labour or the SNP and it got another unwanted Tory government. Polls predicting a massive victory for the SNP were widely disbelieved by almost every serious observer. After all the most often quoted was from the Tory benefactor Lord Ashcroft and that could only be doubted. First Minister and leader of the SNP Nicola Sturgeon also warned against the polls too. After constantly warning that the election was only a two horse race between the Tories and Labour, Labour only won a solitary seat. But, even if every seat had been Labour gains, there would still have been a Conservative majority. This lesson has been learned and will weaken Labour in future contests. Analogies with the 1892 general election were being made concerning a “progressive alliance” between Gladstone’s Liberal Party and the Irish Home Rulers for a Labour-SNP informal alliance. But a closer analogy with the 1918 election when Sinn Fein won most Irish seats seemed more plausible. But these analogies break down because a simple election majority followed by a declaration of independence is now insufficient, if it ever was; it will require another referendum. Yet the Independence Referendum was only eight months ago. It is too soon to make a call for another. Time and chance now control events, but, since then, much ground has shifted. The political processes that created that result have been in flow for some time. I outlined them in a report on the 2011 Scottish Parliamentary elections.2 After a bad start when the Scottish Parliament was inaugurated in 1999, catastrophic Labour incompetence and one tragedy gave Labour three different leaders up to 2007. Then the SNP became the largest party at Holyrood. But it could only rule as a minority government because it could find no partners willing to agree to an independence referendum. A minority government was impossible for the Labour Party who wanted to push through tuition fees for students as well as enthusiastically welcome a replacement for the Trident/ Vanguard submarine nuclear missile system. The SNP Scottish Executive renamed itself the Scottish Government and gained a reputation for competence rather than for radicalism. Under the D’Hondt system, a highest averages method of proportional representation, no one party should be able to dominate, yet the SNP did precisely that in 2011 after a lamentable campaign by the Labour Party. In the Scottish Parliament there are two categories of MSPs: constituency MSPs representing geographical constituencies are chosen on a first-past-the-post system and list MSPs calculated by an elaborate system including the electoral results of the constituency MSPs. The arrogance of the Labour Party towards the list system was so great that that when its “big guns” started losing their constituency seats they did not back themselves up by a second presence on the list. They assumed they would dominate constituency seats. But they only won fifteen constituencies to twenty-two list seats. The much despised list almost saved them. Yet, most of these members were second-raters who revealed their enormous limitations over the Parliament’s lifetime. The massive eviction of competent MSPs has now been added to by the expulsion of almost all Westminster MPs. There is now a large number of career hungry individuals with limited employment prospects chasing a microscopic number of vacancies in a party where large families, cronyism and concealed corruption dominates. Most importantly, they are almost creatures of the machine and incapable of sustaining long periods of opposition without obtaining personal advantage. Fighting from a weak position is unknown to them. Indeed it had become a tradition throughout Glasgow that the Labour Party would not even turn up at any hustings. So-called Labour modernisers may chant media friendly mantras about one-member-one-vote but that is of precious little use when the number of members can be counted on one hand. Absurdly, the SNP’s Trade Union Group is now larger than the entire membership of Scottish Labour. The Scottish National Party is now the UK’s third largest party. The Scottish Parliamentary elections of 2007 and 2011 only laid the foundations for the direction of political flow, but its main force appeared in the two-and-half year run up to the Independence Referendum of 2014. “Near inevitability” of Scottish national independence was how SNP leader Alex Salmond described the 2011 result, but the referendum lodged the unavoidable nature of Scotland remaining with Westminster rule into popular minds. The referendum’s result has been described as a victory for the Parliamentary Union; rather it was a disaster. The result was entirely unexpected. Forty-five per cent of a high turn-out declared they were prepared to abandon their primary, legal and national identity. Such results can usually only be found in countries facing civil war. The SNP’s Yes Campaign drove the vote by launching a massive door-to-door campaign, involving public meeting, events and rallies. There were about fifty or sixty Yes cafés. Numerous groups spontaneously arose to further this process such as Women for Independence, Radical Independence Campaign and others. This meant building a broad and wide coalition for change, nationalist nostrums were not enough. SNP members were urged to keep their messages positive, behave civilly, and even banned from using the word “Freedom.” The common sense wisdom of not talking about politics was abandoned and the subject on everyone’s lip was about why they were voting Yes. A movement for change came into existence. The No campaigners rarely existed on the ground. Often they were identified by their unwillingness to discuss the issue. Their campaigns were conducted through television appearances of specified leaders, mail shots and various media. When they did appear in urban settings it was rarely, if ever, through the Better Together campaign but as the Labour Party “I’m Voting No!” Their statements concentrated on highly personalised attacks on First Minister Alex Salmond. I had some at my door. Throughout the conversation I had to repeatedly inform them that I didn’t support Alex Salmond or the SNP. It was a dialogue of the deaf, they seemed only interested in character assassination. On the only occasion, I ever encountered a Better Together group they spoke in exactly the same way. It was the morning a leak to the papers about a funding gap the Scottish Health Service. They pointed this out to me, and I replied that this was also true about the English Health Service, but, at least we didn’t have Foundation Hospitals, a ridiculous reorganisation and Scottish PFIs have at least been mitigated. I was told this was all Alex Salmond’s fault. “In England too?” I asked. “But it’s ex Salmond’s fault here,” I was told. It went on like this, eventually I came to the conclusion these people got joy at night sticking pins into effigies of Alex Salmond, but lacked any capacity for two-way dialogue. As creatures of machine politics they hoped the Labour machine would carry the vote. It was a seemingly safe option that really carried high risks. Labour was not only identified with unpopular coalition policies, but when Alistair Darling, the most visible Labour MP, could not condemn the attacks underway on sick and disabled people, or the imposition of the Housing Benefit cuts aka the “bedroom tax,” talked up the dynamism of the British economy, defended the presence of nuclear weapons on the Clyde, it became difficult to see any difference between them and the coalition government. Rapidly, the three main parties became known as the Westminster elite. The stand-up comedian Keir McAllister makes the joke that where two or three nationalists are gathered together they try to outdo each other in takes of how morose the Independence Referendum result made them. That was certainly the mood. I felt it necessary counter it by writing A Letter to the Momentarily Disheartened3 to point out how much of a shift had really taken place. As someone who doubted that the Independence Referendum could be won on the first attempt, I was more concerned at observing shifts in mass moods and behaviour as well as significant shifts in policy. Yet it was a result that showed how mass moods had been affected by door-to-door canvassing, public meetings and mobilised activism. – everything that the major parties, especially the Labour Party had grown to despise. The coalition government had destroyed any illusions that the Liberal-Democrats were a softening force in UK politics. The inability of the Labour Party to condemn the cuts to Housing Benefit alienated many supporters even those who were unaffected. It did not create the aspirations for a better country that were being projected by the Yes Campaign. Indeed Chancellor George Osborne was so worried that the “bedroom tax” would so drastically affect the referendum result that after negotiations with Salmond increased Discretionary Housing Payments were allotted to Scotland effectively abolishing it till 2016. Both Salmond and the Tories claimed the credit, Labour silence revealed its growing marginalisation. Throughout the process Labour had no new vision and was seen as a policy sterile area dependent on Tory policies. The referendum result made it impossible to hold leaders debates only between two or three party leaders. The growths of the SNP and UKIP meant that “challenger” or “insurgent” parties could no longer be ignored. And if these two couldn’t be ignored it would be absurd to deny the presence of the Greens or the Welsh nationalists. Interestingly, the Northern Ireland Unionists preferred to lurk unseen in the shadows. But the filtering process of Westminster elections had broken down. Under the he Westminster system of Crown-in-Parliament a two-party system exists in the Comune Concilium (House of Commons) of Government and Opposition because it is only an advisory body to the Crown. It was never designed as a means of popular representation, so it marginalises smaller parties even if they hold majorities in different locations or substantial votes in general. The geographically based constituency assists this process by making it difficult for “minority” viewpoints to be heard. Scottish First Minister Nicola Sturgeon had very little public presence outside Scotland. Even though she was not a candidate, she was a substantial party leader. This was the first time non-candidates and aspirant MPs holding leadership positions were given any media voice in a Westminster election. 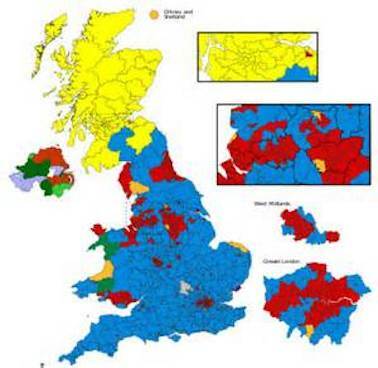 Grafted beneath the two-party Parliamentary system is the electoral system. It is not just a first-past-the-post system; it is 650 first-past-the-post elections held simultaneously so that in aggregate it filters all results into two parties. Minority votes cannot be aggregated so that even substantial votes produce gross misrepresentations. The SNP has been a loser in this approach until this election. UKIP has become the glaring case of under-representation. Because of this voters’ personal preferences are rarely expressed, instead enormous amounts of mental calculating over what way to vote occurs based on guesses of the probable overall outcome. This is why polls of voting intentions are so frequently inaccurate. Appeals to tactical voting were rife with the Scottish edition of the Daily Mail even calling for Labour votes in some constituencies to keep the nationalists out. Former Foreign Secretary Malcolm Rifkind made calls to vote Liberal Democrat for the same reasons. Although this does not set a goal of laying foundations for a socialist society, it is still advance of the policies that were pursued during the election campaign. It is as if they cannot comprehend that the two approaches are entirely different. The don’t seem to understand that republican politics must always take primacy over economic reductionism. They should have made a central demand on the need to call a Scottish Constitutional Convention regardless of the No vote. All bodies resident in Scotland should be asked to submit the types of policies they feel should be included in a future Scottish constitution. It is also essential that no backsliding over the presence of Trident/ Vanguard missile submarine system occur. This is already happening by confusing the straight-forward call for the Faslane and Coulport bases to be closed with opposition to the Trident/ Vanguard successor system being voted upon. A nationwide referendum similar to that used by Strathclyde Region to register the scale of opposition to water privatisation should be launched by a future Scottish Government to lodge the unwillingness of the Scottish people to the continued presence of these weapons of mass destruction on Scottish soil and territorial waters. It is necessary to advance the momentum of the campaign by these policies. Steve Freeman’s campaign in Bermondsey launched the first major attempt to oppose the economic reductionism of various other socialists. In this current historical period, no socialist campaign is likely to obtain anything other than derisory levels of votes, but registering a republican perspective to campaigning of approaching the major issues has been long overdue. At this time many still find the necessity of a political challenge to capitalism as expressed by the Westminster system of government difficult to understand. Too many feel enormous unease at leaving their comfort zones of moral pontification over austerity than gathering votes and support. The SNP had a significant presence in the two intakes of the Westminster Parliaments of 1974. They were not an impressive bunch, a bit like the dreariness of much Scottish life then. They held no strategy of how they planned to win Scottish national independence other than by voting for more people just like themselves. It was persecution based nationalism resting on various assembled grudges often centring on ownership of North Sea oil and rising unemployment. It had no positive vision of a better of different kind of Scotland. The churchiness of many of these members was not an appealing prospect, although the influence of various churches was still considerable inside all parties. Their undistinguished presence left no legacy upon which anything worthwhile could be built. It took Alex Salmond’s appearance in the late eighties for a dynamic, more engaged, constructive vision to be built. He has played a role unlike any other leader of the Conservative or Labour parties. Apart from Jim Sillars, he has kept all possible leadership contenders away from launching fratricidal conflicts. His relationship with Nicola Sturgeon is friendly and co-operative showing no signs of eventual deterioration. Although he has returned to Westminster, he has not sought leadership of the SNP group deferring to the existing leader Angus Robertson. It is a presence designed to contrast with his major competitors. The rest of the new intake are mainly unknown even if they were politically active because the media focus on the leadership cults has left them still to be discovered by others. Their performance is yet to be tested. The Scottish Parliamentary elections of 2016 will be next major electoral challenge. As well as Scotland and Wales, London will also have its elections. This will be the only election that can assess the Conservatives. In Scotland, Labour may even become a smaller party and SNP numbers grow. There may even be the entire extinction of the Liberal-Democratic Party and Conservatives. As battles develop over the European Union, Trident/ Vanguard renewal, devolution powers and austerity cuts, fewer people in all nations and everywhere from the midlands north will feel much in common with a Westminster they increasingly feel is failing them. But, at least in Scotland a movement of resistance is emerging. What appears as a shock result belies a deep-going process of transformation, opening a period of political volatility of rising demands for rights that test and will break the limits of parliamentary democracy. Although turn-out was up slightly, a third of voters stayed at home, feeling that their votes counted for little. A system that produces a dominant government which has the backing of under a quarter of those entitled to vote is democratic in name only. Safe to say, however, the mainstream parties have no intention of changing this. Why would they? The skewed voting system is but an expression of one-sided state rule that speaks predominantly for corporate and financial power. The markets are happy with Thursday’s outcome – and that’s what counts in reality. Demands for voting reform will only intensify the constitutional impasse, therefore, as they will fall on deaf ears. Yet the system is fracturing and fragmenting before our eyes. Dependent for the last 70 years on the two-party, my-turn-your turn arrangement for legitimacy, it can no longer do so. That has been broken by Labour’s demise, perhaps irrevocably. The historic wipe-out of Labour in Scotland makes it difficult to see them ousting the SNP from working-class constituencies any time soon. This is the pay-back for Ed Miliband’s crass alliance with the Tories to thwart self-determination in the referendum, the patronising, right-wing nature of Labour in Scotland and the party’s identification with the Westminster political elite. Miliband’s dismissive description of the anti-austerity tide sweeping Scotland as a “wave of nationalism” showed precisely where his party stood in the election – for continuing cuts, for nuclear weapons and for an outdated political union dependent on Westminster. This more than any demonising of Miliband by the right-wing press cost Labour. While the SNP distinguished themselves from Labour and Tories by being anti-austerity, Labour was identified with the Tories. In England, many inner-city areas had turn-outs of under 60%; in Scotland, some constituencies produced a turn-out of over 80% and a 20-year old student defeated Douglas Alexander, the so-called architect of Labour’s disastrous campaign. Add in the planned redrawing of constituency boundaries in favour of Tory-voting areas and the rise of Ukip in areas like the North-east – they finished a strong second in 120 seats nationally – and the future is bleak for Labour. The appeal of the right-wing populist Ukip is to voters betrayed by Labour, which accounts for most of the party’s nearly 4 million votes (giving them just one seat). A million people also voted Green in anti-establishment, anti-austerity defiance. The fact that Labour is unlikely to be able to form a majority government in the near future, if ever again, is therefore an integral part of the growing constitutional crisis. It calls into question the whole doctrine of parliamentary politics as the only route we can pursue to seek change. Corporate-driven globalisation has for at least three decades if not longer denied social democratic reformism the space to operate. The Blairites recognised this and created pro-market New Labour. Under Miliband, a halfway-house of total confusion took over. Vague policies based on creating a “responsible capitalism” through state intervention and regulation had little appeal or substance. Aligning themselves with Tory budget cuts and a public sector pay freeze revealed Labour as a pale imitation of the Tories. This proved decisive in allowing the reactionary Tories to triumph at the polls. Voters concluded that it was better to vote for the real thing. In England, the Tories’ share of the vote was an astonishing 41% and Labour ended up with almost 100 fewer parliamentary seats than Cameron after its worst election performance since 1987. Part of the responsibility for the Tory victory should also be laid at the doors of the trade union bureaucracy of the major unions, Unite, Unison and the GMB. They financed the campaign to elect Miliband as Labour leader in exchange for which they abandoned anything but token resistance to Tory cuts and attacks on pensions. Miliband gave them nothing in exchange – no commitment to repeal the anti-union laws or abandon Tory spending cuts. Yet the union leaders kept their heads down and sustained the illusion that Miliband and Labour was the answer. What a waste of resources. Union members should demand their organisations join others in withdrawing from Labour and spend their money on alternative means of political representation. The Conservative win reflects the misleading appearance of an improving economy, whose “recovery” is funded by record and increasing levels of public and private debt. Renewed global recession is on the horizon, having been postponed by gargantuan inventions of new credit by the European Central Bank and the Bank of Japan among others. Against this background, austerity will continue and deepen in every part of the UK. Resistance to this is centred in Scotland, where its voters placed their hopes and aspirations in the anti-austerity stance of the SNP. The SNP is, however, riding the tiger of Scotland’s May 7 Revolution and as a party of business will not be able to resist austerity and spending cuts. And the Tories are planning to cut financial support to Scotland in exchange for further devolution of powers from Westminster as promised after the referendum. Stand by for the green light to the frackers once Scotland’s own elections are out of the way next year. The outcome of the election brings the questions of democracy and power to the fore in every nation in Britain. Only the Greens raised this issue, otherwise who is in charge and who has the power was never spoken about. That’s why Miliband was rightly seen as hollow. The Tories’ plan for a referendum on the European Union will use nationalism to avoid this question and we should say now that there can be no real democracy so long as corporate and financial power holds sway. It’s not Brussels or London that’s decisive but on whose behalf decisions are made. To resist austerity and deep spending cuts, the renewal of Trident, the onslaught of fracking, the continuing marketisation of the NHS and the attack on human rights now planned, we cannot depend on others to do our fighting for us in Parliament. As we cannot even achieve modest reforms through Parliament, then a more direct form of democracy, that provides people with real power, is the way forward. Let’s move beyond a system that is no longer representative to one that gives control over resources and decision making to ordinary people and their communities. Who will defend people from austerity and who will look to fix this broken system? Who will look to replace the corporatocracy that resumes control at Westminster after the inconvenience of an election? People everywhere in UK can only do it for themselves. That’s the importance of developing the Assemblies for Democracy into a movement that can help facilitate and inspire a transition to a real democracy. A network of Assemblies throughout the UK can lead to a citizens’ assembly on the constitution, for example, which Occupy Democracy and others are campaigning for. An unrepresentative Parliament imposing the demands of the financial markets on the 75% who didn’t vote for the government has no authority or real legitimacy. We need to take our democratic achievements into a new era, where social rights like replacing corporations with co-operative ownership are enshrined in a people’s constitution. That’s the big lesson of the 2015 general election.